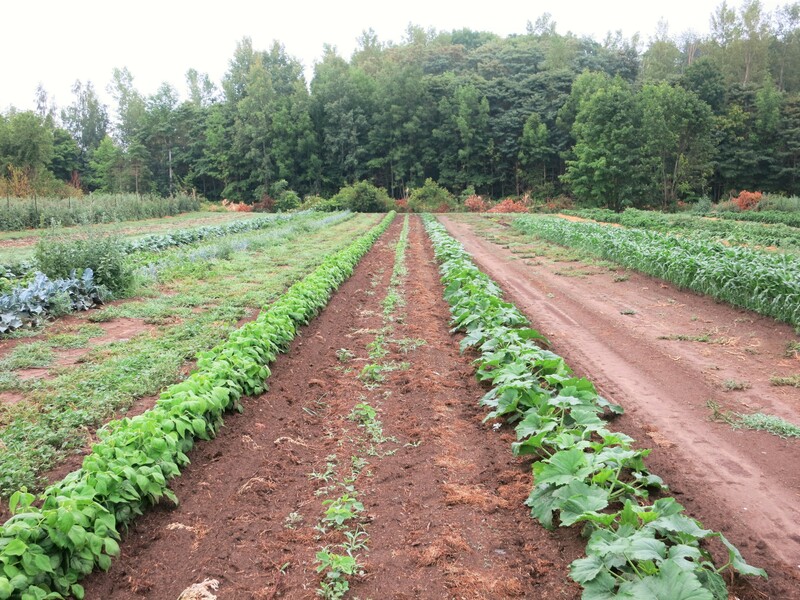 Almost an inch of rain fell on Sunday morning – enough to really soak into the ground & satisfy the thirst of many of the vegetables. They responded immediately with increased growth & renewed colour – as did the weeds, that seemed to magically appear overnight. … with this one that I posted last week of the same rows. The growth is phenomenal! We quickly began to mulch the zucchini to keep that moisture from disappearing & the weeds from appearing! The older zucchini patch that we have been picking is quickly finishing, or at least taking a mid-season break. Perhaps yesterday’s rain will give it enough energy to produce more blossoms & zucchini yet? 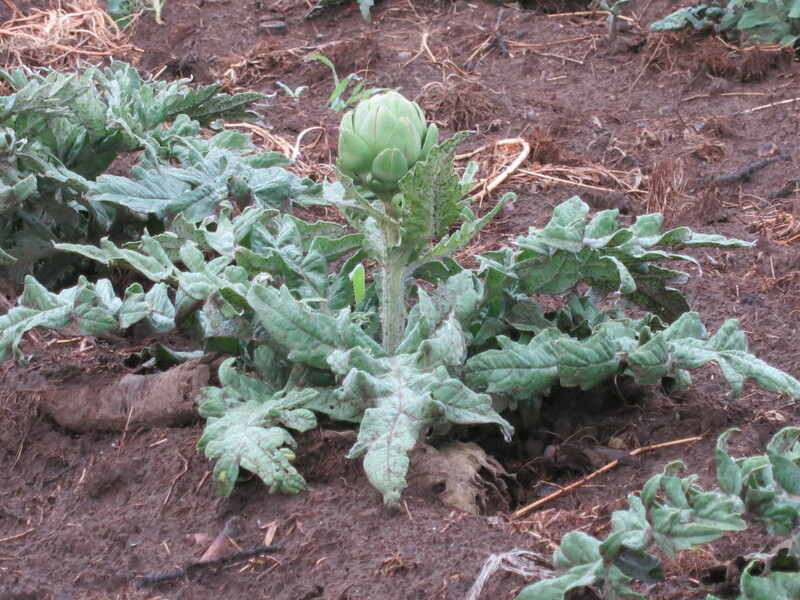 Other crops that are beginning to produce are sweet & hot peppers, eggplant & even our artichokes. 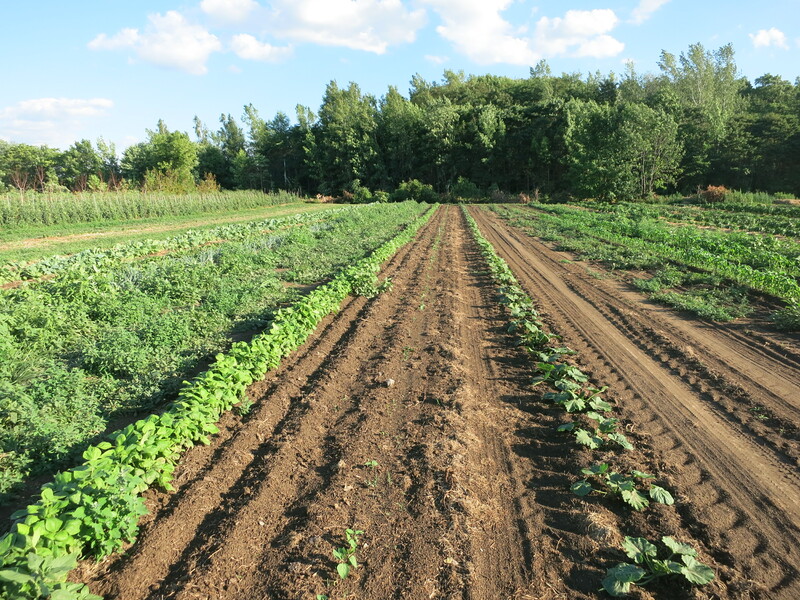 We are not harvesting enough of these vegetables yet to put in the CSA boxes … maybe in a couple of weeks? Garlic, collards, kohlrabi, tomatoes, beans, beets, onions. 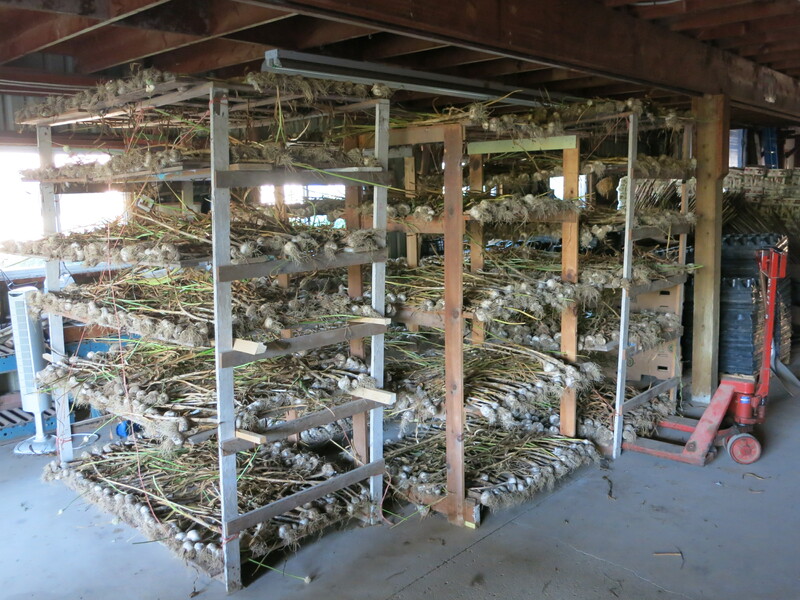 Our garlic has been harvested & we have it drying on racks in the barn. The sight & smell of it had many CSA members drooling when they picked up their boxes last week. It’s not dry yet – but why wait!? Your first, fresh garlic bulb will be in your share this week – with many to follow. You will probably want to use it & enjoy it immediately. Because it is not dry it should be kept someplace with good air circulation, and out of the sun. Do not put in plastic or in the fridge. Once the bulb has been started, try to finish using it within a few days. We offered collard greens in the basket back in week 6, and gave some instruction then on how they might be cooked. The next planting of kohlrabi is ready to eat. This time we have purple kohlrabi as well. Only the outside is purple – the inside is white. Use it the same as the white kohlrabi – no difference in flavour at all. Tomatoes, beans, beets & onions – summer standards that you will find in your box again this week.